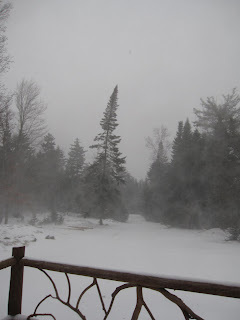 It is finally snowing here in the Adirondacks. Of course, the 50 mph wind gusts are relocating and drifting the snow flakes before they even have a chance to get comfortable on the ground. 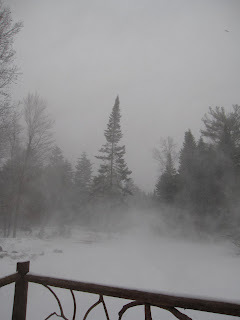 I was reminded of some of the nearly instinctive things we Adirondackers do on days like this when I spoke to my friend earlier today. She is an artist who owns a small business here in the Adirondacks. The holidays are one of her busiest times of year because her products make the perfect gift. She laughed as she told me how the first thing on her mind this morning, when she woke to the sound of the howling wind, was to immediately print enclosures and prepare today's orders for shipment. Her husband had already filled the water bottles, as I just did, and a large pile of firewood was brought in last night. "Just in case" is our mantra for days like this, because we could lose electricity and it never hurts to be prepared.As a matter of fact, I'd better get this published as the lights just flickered! 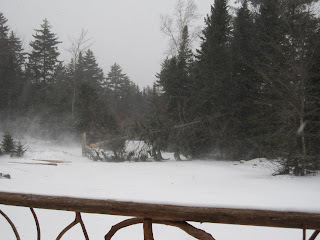 Today's featured photos show my favorite, picturesque but exposed and vulnerable balsam, doing her best to withstand the brutal winds.